If You have applied for a ration card and now you want to see if your name comes in the ration card list or not. So today we will tell you in this article how you can check your name in the ration card list sitting from the house. Whether you are resident of any state of India today, with the help of this article written by us, you can check your name online in your state's ration card list. Antyodaya Ration Card, it is given to the poorest of the people. First you have to go to its official website https://nfs.delhi.gov.in/. After this you will have to click on the link below View Ration Card Details. After that click on the button 'Search' which appears below. After which a page will open before you, from which you will have to fill out any one of the information. After that you will see the complete information about your ration card. In order to check your name in the Haryana Ration Card list, you must first go to its official website at http://haryanafood.gov.in. After this you get e-Gov. To go to Applications, click the ePDS link. You will then have to click on the link of the Ration Card. After that a page will open in front of you in which you have to select your district. You will then have to select the name of your AFSO tahsil. You have to select the name of your Ration Shop FPS ID and FPS Owner. Then you will see a ration card list of your area in which you can check your name. First you have to go to its official website http://sfc.bihar.gov.in/login.htm. You will then have to click the link to 'Ration Card Details'. You will then have to select the name of your ration card number and its shopkeeper. After this you will see a list in which you have to select according to your name and ration card number. After that you can see the complete information about your ration card. First Visit their website http://fcs.up.nic.in/ on its official website. After coming to the official website, you will find 'NFSA'. Click on the link of 'Eligibility List'. Then you have to choose your district. After this you have to choose your town (village). You will then have to click on the front link of the name of your ration shop shopkeeper. After which you will be shown your area's ration card list. In which you can check your name. After this you will have to click on the link of 'List of newly added BPL / AAY families'. After that you have to select your district, local body, village-panchayat / zone and village / mohalla and click on the button 'View list' shown below. 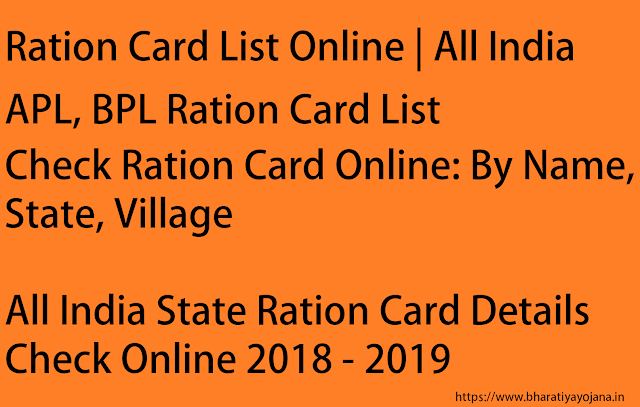 After clicking, you will see your area's ration card list. In which you can check your name. Visit their official website https://wbpds.gov.in/. After this you have to go to 'REPORTS ON NFSA' and click on the link 'Search Beneficiary Details By Name'. →Name - You will have to fill some letters of the beginning of your name as if you know that your name is 'RAHULGUPTA' then you only need to fill in the letter 'RAHUL' in it. After that you can see digitally West Bengal ration card list. In addition, if you know your Ration Card number, you can also check your name in the Ration Card list by selecting the 'Ration Card Number' option. After this you have to click on the link 'Chhattisgarh Food Safety 2012 - Online'. Then a page will open in front of you, in which you will have to click on the link 'Storewise Distribution List for Food Allocated in New October, 2018'. After which you can get your district, urban / rural, urban bodies and U.M. Select the name and click on the 'View information' button showing below. After which the ration card list will appear in front of you. In which you can check your name. First You have to go to its official website http://fcs.uk.gov.in/. After this you have to click the link "Ration Card Details". After clicking, a new page will open in front of you in which you will have to fill the captcha code and click on the button next to 'Verify'. After which you have to fill all the details given below correctly. After which you will have to click on the button 'View Report' which is visible below. After which you can check your name. For this you must first go to http://fcs.assam.gov.in ie its official website. You will then have to click on the link to 'Ration Card Report'. After this you have to choose your district. After selecting the district you will have to select your tahsil. After selecting Tahsil, you have to choose your village. After that you will see a ration card list of your village or area in which you can check your name. First you have to go to its official website https://ahara.kar.nic.in/home.aspx. After this you have to click the link of 'E-Service'. Then a page will open in front of you, by going to the 'e-fair price shop' and clicking on the link 'P.Show List'. After clicking, a page will open, in which you have to select your district, taluk and shop and click on the button 'Go' appearing below. After which the ration card list will be opened. In which you can check your name. First you have to go to its official website http://civilsupplieskerala.gov.in. You will then need to go to 'NFSA' and click on the link to 'Ration Card Details Report'. After this, a popup window will open in front of you, in which you will have to click on the 'Total No: of RationCards' link on which some numbers are visible. Then a new page will open in front of you in which you have to select your district. After which you will see a ration card list in which you can check your name according to your ration card. First you have to go to its official website http://www.goacivilsupplies.gov.in/. After this you will have to go to 'E-Citizen' and click on 'Know Your Ration Card'. Then you have to select your district. After this you have to select your taluka. Then you have to choose your village. After that you will see a ration card list of your area in which you can find your name. First visit their official website www.epds.punjab.gov.in. After this you will have to login with your username and password. You will then have to click on the link 'Punjab Ration Card List 2018'. After clicking, a new page will open in front of you, by filling your district, block, village and proper rate shop number and clicking on the 'View Report' button. After that you will open a Ration Card list in your area in which you can check your name. Go to their official website https://aahar.jharkhand.gov.in. After coming to the official website, you will have to go to 'Cardholder' and click on the link 'Ration Card Details'. After this, a page will open before you, in which you have to first select your district and then the block. Then you have to select 'Village / Ward' below. After this, you will have to select your card in 'Cardtype'. You will then need to click the 'Capture' button below and click on the 'Submit' button. After that you will see a ration card list in which you can easily check your name. First of all you will have to go to its official website pdsmanipur.nic.in. After this you will have to click on the link 'ePDS' appearing above. After clicking, a new page will open in front of you in which you will have to click on the link 'Search Ration Card with FPS'. After this you have to select the following options. Then you have to click on the 'Continue' button, which appears below. After that you can check your name in Manipur Ration Card List. First Visit their official website http://food.raj.nic.in/. After this you will have to click on the link 'View the details of Ration Card and Ration Distribution' by going to 'Ration Card Report'. Then a new page will be opened to you, in which you will need to fill the following details and click on the button to search. After which you can check your ration card. First you have to go to its official website https://fcsca.mizoram.gov.in. After coming to the official website, you will need to click on 'Ration Card' and click 'Beneficiaries' and click on the link 'NFSA Beneficiaries'. After clicking, a page will open in front of you in which you must first select the name of DCSO. Then the village, FPS will have to be selected, after which you will see the ration card list of your area. For this you must first go to http://megfcsca.gov.in/default.htm on its official website. After coming to the official website, you will need to go to 'Online Services' and click on the link of 'List of Beneficiaries'. After this you will have a page open where you will have to select your district. Then you have to choose your tahsil. After this you have to select your FPS. After that you have another page that will have to fill the name of the ration card holder in the 'Search' box and click on the search button. After that you will be able to see the complete information of your RTO card in front of you. First Go to its official website ie http://fcatripura.gov.in/. After coming to the official website, you will have to click on the link to 'Ration Card Details'. After clicking, a new page will open in front of you, in which you have to select the following options and click on the button 'View Report'. Firstly you will have to go to this link at https://epds.telangana.gov.in. After this you have to click on 'Reports'. After clicking on the reports, a page will be opened for you, in which you will have to go to the 'Ration Card Report' and click on the link 'FSC Card Status Report'. Then you have to first select your 'District'. After this, you have to select 'Office'. Then you have to select your 'Shop No'. After this you will see a ration card list in your area, in which you can easily check your name. After coming to the official website, you will have to go to 'e-PDS Reports' and click on the link 'Ration Card Details'. After this, a page will open before you, in which you have to first select your 'District'. After selecting the district you will have to select your 'Tehsil'. After this you have to select your 'Village'. Then you have to select your 'FPS'. After this you will be shown your area's ration card list.